It seems that all of our local highway passes are now closed again: Highways 4, 108 and 120 have been shut down due to the big spring storm. That means that Ebbetts, Sonora, and Tioga Passes are closed. The weather is expected to warm up eventually, maybe by next weekend, and the roads can be opened again by then. But as long as Mother Nature keeps dropping snow on the ground, the roads will be hard to predict. And so will the conditions in the mountains. Our advice? Head for lower elevations, where you are more likely to be able to get to a trailhead, or get out after you return from the hike. And take along a little extra clothing, so that you can put on some dry clothes in the tent. But even if the highway is open, be careful out there. As we noted in our last post, snow is NOT your biggest concern in the spring. High water and roaring streams are a bigger worry. Take it easy, and don't be afraid to be smart. If the stream looks to big and fast to cross, it is. Look for another option, or head in another direction. That's P's brother at right, crossing a small creek about this time of year. 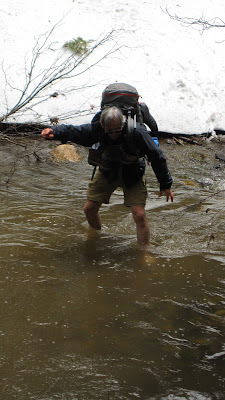 As you can see, the creek wasn't very deep, but the approach was down a steep snow bank. Not all fun and games, but we did it slowly and carefully. And we had a great time.